The quote below struck a chord with me because Mark Zuckerburg touches on the exact stat I’ve been thinking about and measuring at theSkimm for some time now — the distribution of weekly usage. What percent of people used [Facebook] six out of seven days of the week…that number for the first time in the last quarter passed 50%. Sure, the oft-cited DAUs / MAUs — daily average uniques as a % of monthly average uniques — is an interesting stat, but often doesn’t tell enough of the story. What Zuck is calling attention to is that not only are a lot (63%) of random monthly users visiting Facebook on any given day, but more importantly, over half of them use Facebook regularly as part of their daily routine. Granted this Facebook stat is across both desktop and mobile, but I’ll touch on how this applies to mobile apps shortly. So why is this data point more telling than DAUs/MAUs? It depends on the company and vertical. But to put it simply, in social it’s the difference between a lot of one-and-dones visiting (an eyeball) and people who can’t live without your service (a habit). Think Vine vs. Facebook. When I worked in equity research covering cable and satellite TV companies, we often referenced the following statistic — “TV viewers have the bandwidth for 12-15 channels.” After that short list, all other channels are trivial for most individuals. I’ve always felt the same applied to mobile apps. For many today, this is their homescreen and/or second page of apps. Taking habits and bandwidth to the next level, I saw a good quote recently from Nuzzel CEO, Jonathan Abrams — “We asked investors who were Nuzzel fans how many other apps or services they used several times per week, that were not yet worth at least $1 Billion, and the answer was always a very short list.” And these investors are likely the extreme rather than the norm. That quote absolutely supports data I’ve seen that suggests the average person only uses 2-3 apps almost every day of the week. Given consumers limited bandwidth and the challenges of behavior change, would you rather be an app delivering eyeballs or an app delivering engagement? Let’s take a look at some of today’s biggest players in mobile social apps — Facebook, Twitter, Instagram, Snapchat, and WhatsApp. The data below is from paid surveys I’ve recently fielded using the increasingly valuable Google Consumer Surveys (GCS). For the purposes of this post, I’m going to use Net Promoter Scores as a proxy for satisfaction and loyalty. In order to minimize noise, the data below only includes respondents that I considered to be regular users of an app, which in this case (social) meant usage of at least 2 times per week. 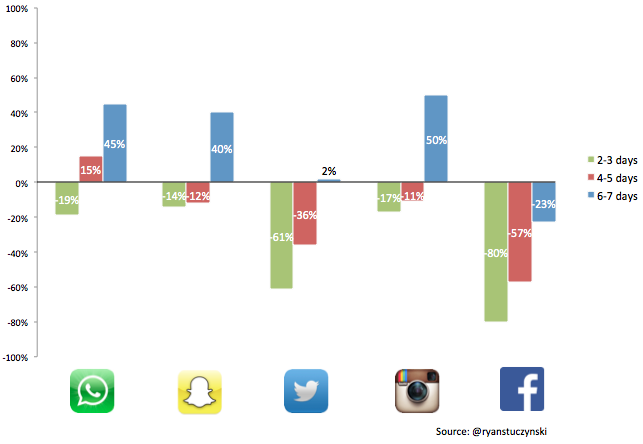 Facebook and Instagram are the clear winners when it comes to daily usage. 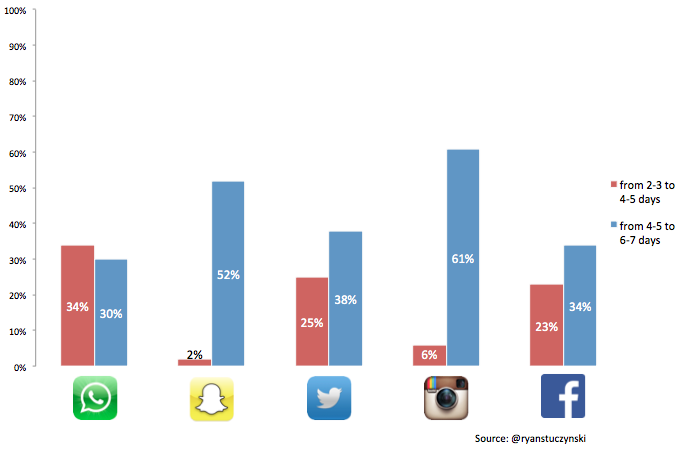 Twitter and Snapchat are clearly in the daily mix but are behind by a reasonable margin. WhatsApp is not quite a mainstream daily habit yet. However, it isn’t far off with 31% of respondents using the app often and perhaps on their way to using it daily — joining the two other Facebook apps atop the leaderboard. Snapchat has a lot a lovers, but also has the most users in the “I’m not quite sure what to make of this” camp. To help qualify the GCS data above, if the 1x per week users were included in the chart, the % of users using Facebook at least 6-7 days a week would have been 48% — roughly in-line with the global number Zuck references above. Without going into too much detail about the chart above, you can see that there’s a pretty clear relationship between app usage and NPS scores (or the likelihood to recommend). The more you use an app, the more likely you are to be happy with it OR the more happy you are with an app, the more likely you are to use it. Regardless of how you frame it, that relationship seems pretty clear and intuitive. You can see in the chart above that movements in usage from occasional to often and often to daily are not equal when considering NPS. 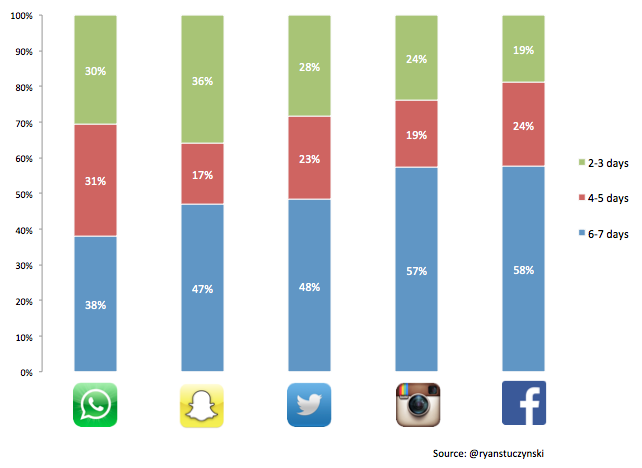 There’s a disproportionate return on NPS when you become someone’s daily habit, the exception here being WhatsApp. How much so? Well, if your core capability is delivering images and video, it’s seemingly crucial to your success. If you are a more broadly-used communications tool, you could argue the impact is less dramatic, but still extremely meaningful at scale. Wouldn’t it be great to see these same breakouts for Uber vs. Lyft, Pandora vs. Spotify, Secret vs. Whisper? While the return on daily usage in social is tremendous, it’s the behavior that drives those outsized returns that I’m most interested in. For example, take Instagram — I’ve seen data that suggests one of its core use cases for its daily users is people checking it early in the morning to help stimulate them visually and wake them up. Not the most obvious use case, but an important part of some morning routines. That’s just one example. It’s important to remember that not all users are created equal. Understanding the distribution of usage and those needs being served is what’ll continue to drive those outsized returns over time. → I ran 5 independent surveys that were limited to adults 18+ in the U.S. and respondents were only exposed to three questions. In total, I collected over 8,000 responses. 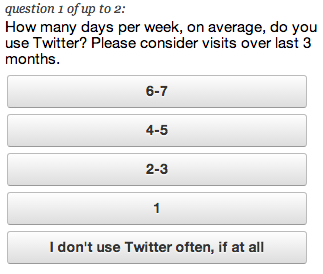 → To see all three questions, a respondent must have used one of the apps at least 2-3 times weekly on average, over the preceding three months. Those that did not qualify were screened out. Growth @theskimm. Previously led analytics @fab. Love to learn. Passionate about startups, sports (esp Cleveland), opportunity, and optionality.